Reigning World Champion USA started their title defense strong by defeating Sweden 84-0 (46-0) in their opening game. 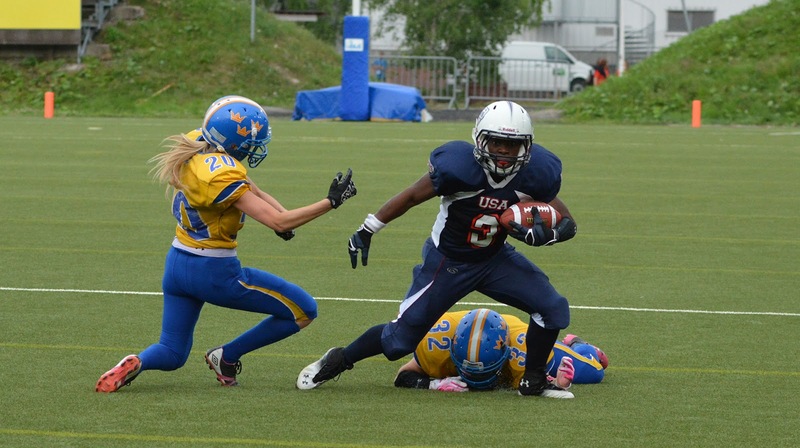 USA showcased its wide talent and had eight different players scoring touchdowns. Most scores got runningback CASSEY BRICK, who scored three touchdowns. USA’s MVP was quarterback Samantha Grisafe and Sweden defensive back Emma Bendorf. Sweden will play next against Germany on Tuesday while USA will meet Germany on Thursday. FUMBLES: SWEDEN-Carrick S 2-2; Gimhag M 1-1; Beckman S 1-1. USA-Jenkins O 1-1. 1 Benndorf E 4 3 5.5 1.0/1 . . . . . . .
7 Jernberg A 4 2 5.0 . . . . . . . .
32 Kiviharju E 4 1 4.5 . . . . . . . .
33 Lov F 3 . 3.0 . . . . . . . .
77 Elmessaoudi Y 3 . 3.0 1.0/1 . . . . . . .
25 Svensson E 2 2 3.0 . . . . . . . .
22 Ek-Terlecki F 2 1 2.5 . . . . . . . .
55 Erhardsson A 2 1 2.5 . . . . . . . .
21 Kjellin E 2 1 2.5 . . . . . . . .
42 Nyman V 1 1 1.5 . . 1-0 . . . . .
10 Hammarback E 1 . 1.0 . . . . . . . .
20 Aslund A 1 . 1.0 . . . . . . . .
70 Garchi N 1 . 1.0 . . . . . . . .
4 Holm E 1 . 1.0 . . . . . . . .
34 Carrick S . 1 0.5 . . . . 1 . . .
8 Arnfridsson M . 1 0.5 . . . . . . . .
45 Plummer J 5 2 6.0 0.5/3 . . . . . . .
82 May R 4 2 5.0 2.5/13 . . . . . . .
44 Eddy V 4 1 4.5 1.5/6 . . . . . . .
30 Hinkle L 4 1 4.5 1.5/3 . . 1-0 . . . .
13 Welter J 4 1 4.5 2.0/12 . . . . . 1.0/11 . 17 Campolo A 3 . 3.0 . . . . . . . .
47 Martin K 3 . 3.0 2.0/8 . . . . . . .
68 Blackmon K 2 1 2.5 1.0/4 . 1-0 . . . . .
81 Deering J 2 . 2.0 2.0/16 . . . . . 2.0/16 . 21 Brownson C 2 . 2.0 1.0/1 . . . . . . .
16 Sowers K 2 . 2.0 . . 2-14 . . 1 . .
8 Vasquez S 1 1 1.5 . . . . . . . .
22 Reyes A 1 1 1.5 . . . . . . . .
83 Peterson H 1 . 1.0 . . . . . . . .
6 Gore R 1 . 1.0 . . . . . . . .
3 Jenkins O 1 . 1.0 . . . . . . . .
46 Elmore K 1 . 1.0 . . . . . . . .
9 Gray J 1 . 1.0 . . . . . . . .
26 Converse C . . . . . 1-0 . . . . .
43 Golay D . . . . . . . 2 . . .
SWEDEN: 1-Benndorf E, 5-Angstrom F, 6-Lundstorp B, 7-Jernberg A, 27-Blom Lindvall V, 34-Carrick S, 42-Nyman V, 60-Honk R, 61-Handel I, 70-Garchi N, 81-Klang E, 88-Jenderklint S.
USA: 2-Bushman B, 3-Jenkins O, 5-Mulligan K, 10-Smith A, 12-Larsen A, 17-Campolo A, 18-Brickhouse M, 22-Reyes A, 23-Vilarino N, 24-Fitcheard-Bryso, 26-Converse C, 28-Hatcher B, 33-Wilkinson D, 41-Klessa K, 45-Plummer J, 46-Elmore K, 47-Martin K, 50-Marshall A, 55-Walter K, 68-Blackmon K, 72-Engelman T, 74-Worsham R, 84-Snyder A.
Sw 1-10 at Sw30 US ball on US30. 12-Larsen A kickoff 50 yards to the SW20, 14-Persson A return 15 yards to the SW35 (8-Vasquez S). Sw 1-10 at Sw35 12-Gimhag M pass incomplete to 14-Persson A, PENALTY US offside 5 yards to the SW40, NO PLAY. Sw 1-5 at Sw40 12-Gimhag M pass incomplete. Sw 2-5 at Sw40 PENALTY SW false start 0 yards to the SW40. Sw 2-5 at Sw40 2-Beckman S rush for 11 yards to the US49, 1ST DOWN SW.
Sw 1-10 at Us49 PENALTY SW false start 5 yards to the SW46. Sw 1-15 at Sw46 34-Carrick S rush for 5 yards to the US49, out-of-bounds. Sw 2-10 at Us49 12-Gimhag M pass incomplete (43-Golay D). Sw 3-10 at Us49 SWEDEN drive start at 10:49. Sw 3-10 at Us49 SW ball on US49. Sw 3-10 at Us49 2-Beckman S rush for no gain to the US49 (68-Blackmon K). Sw 4-10 at Us49 4-Holm E punt 39 yards to the US10, downed. Us 1-10 at Us10 USA drive start at 10:14. Us 1-10 at Us10 25-Brick C rush for 16 yards to the US26, 1ST DOWN US (10-Hammarback E). Us 1-10 at Us26 15-Grisafe S pass complete to 3-Jenkins O for 11 yards to the US37, 1ST DOWN US (33-Lov F). Us 1-10 at Us37 15-Grisafe S rush for 3 yards to the US40 (33-Lov F). Us 2-7 at Us40 15-Grisafe S pass complete to 28-Hatcher B for 3 yards to the US43 (33-Lov F). Us 3-4 at Us43 15-Grisafe S pass complete to 83-Peterson H for 23 yards to the SW34, 1ST DOWN US (22-Ek-Terlecki F;21-Kjellin E). Us 1-10 at Sw34 15-Grisafe S pass complete to 25-Brick C for 34 yards to the SW0, 1ST DOWN US, TOUCHDOWN, clock 08:01. 18-Brickhouse M rush attempt good. 12-Larsen A kickoff 55 yards to the SW15, 9-Alison M return 13 yards to the SW28, out-of-bounds (44-Eddy V). Sw 1-10 at Sw28 SWEDEN drive start at 07:56. Sw 1-10 at Sw28 2-Beckman S rush for loss of 4 yards to the SW24 (30-Hinkle L;44-Eddy V). Sw 2-14 at Sw24 15 pass incomplete to 4-Holm E, PENALTY SW ineligible downfield on pass 5 yards to the SW19, NO PLAY. Sw 2-19 at Sw19 12-Gimhag M rush for 5 yards to the SW24, out-of-bounds. Sw 3-14 at Sw24 4-Holm E punt 46 yards to the US30, downed. Us 1-10 at Us30 USA drive start at 06:34. Us 1-10 at Us30 25-Brick C rush for 8 yards to the US38 (7-Jernberg A). Us 2-2 at Us38 15-Grisafe S pass complete to 83-Peterson H for 13 yards to the SW49, 1ST DOWN US (7-Jernberg A;1-Benndorf E). Us 1-10 at Sw49 15-Grisafe S pass incomplete to 23-Vilarino N.
Us 2-10 at Sw49 PENALTY US false start 5 yards to the US46. Us 2-15 at Us46 15-Grisafe S pass complete to 10-Smith A for 54 yards to the SW0, 1ST DOWN US, TOUCHDOWN, clock 05:20. 12-Larsen A kickoff 50 yards to the SW20, 9-Alison M return 8 yards to the SW28 (45-Plummer J). Sw 1-10 at Sw28 SWEDEN drive start at 05:13. Sw 1-10 at Sw28 2-Beckman S rush for loss of 1 yard to the SW27 (30-Hinkle L). Sw 2-11 at Sw27 12-Gimhag M pass complete to 8-Arnfridsson M for 7 yards to the SW34 (44-Eddy V). Sw 3-4 at Sw34 12-Gimhag M pass complete to 4-Holm E for 3 yards to the SW37 (82-May R). Sw 4-1 at Sw37 4-Holm E punt 34 yards to the US29, 6-Gore R return 17 yards to the US46 (55-Erhardsson A). Us 1-10 at Us46 USA drive start at 02:53. Us 1-10 at Us46 15-Grisafe S pass complete to 41-Klessa K for 38 yards to the SW16, 1ST DOWN US (7-Jernberg A). Us 1-10 at Sw16 15-Grisafe S pass complete to 18-Brickhouse M for 4 yards to the SW12 (25-Svensson E). Us 2-6 at Sw12 84-Snyder A rush for 9 yards to the SW3, 1ST DOWN US (7-Jernberg A). Us 1-G at Sw03 3-Jenkins O rush for 3 yards to the SW0, TOUCHDOWN, clock 01:32. 12-Larsen A kickoff 50 yards to the SW20, 9-Alison M return 14 yards to the SW34 (45-Plummer J). Sw 1-10 at Sw34 SWEDEN drive start at 01:26. Sw 1-10 at Sw34 2-Beckman S rush for loss of 2 yards to the SW32 (47-Martin K). Sw 2-12 at Sw32 12-Gimhag M sacked for loss of 7 yards to the SW25 (81-Deering J). Sw 3-19 at Sw25 12-Gimhag M pass incomplete. Sw 4-19 at Sw25 4-Holm E punt 33 yards to the US42, 25-Brick C return 33 yards to the SW25 (4-Holm E). Us 1-10 at Sw25 USA drive start at 00:00. Us 1-10 at Sw25 Start of 2nd quarter, clock 12:00. Us 1-10 at Sw25 5-Mulligan K pass incomplete to 9-Gray J. Us 2-10 at Sw25 5-Mulligan K pass complete to 83-Peterson H for 1 yard to the SW24 (22-Ek-Terlecki F). Us 3-9 at Sw24 3-Jenkins O rush for 5 yards to the SW19 (32-Kiviharju E). Us 4-4 at Sw19 Timeout USA, clock 11:03. Us 4-4 at Sw19 18-Brickhouse M rush for 10 yards to the SW9, 1ST DOWN US (55-Erhardsson A). Us 1-G at Sw09 5-Mulligan K pass incomplete to 9-Gray J (34-Carrick S). Us 2-G at Sw09 5-Mulligan K pass incomplete to 28-Hatcher B. Us 3-G at Sw09 5-Mulligan K pass complete to 9-Gray J for 9 yards to the SW0, TOUCHDOWN, clock 10:23. 84-Snyder A rush attempt good. 12-Larsen A kickoff 45 yards to the SW25, 14-Persson A return 5 yards to the SW30 (6-Gore R). Sw 1-10 at Sw30 SWEDEN drive start at 10:17. Sw 1-10 at Sw30 2-Beckman S rush for 1 yard to the SW31 (13-Welter J). Sw 2-9 at Sw31 12-Gimhag M pass incomplete to 8-Arnfridsson M.
Sw 3-9 at Sw31 12-Gimhag M sacked for loss of 11 yards to the SW20 (13-Welter J). Sw 4-20 at Sw20 Timeout SWEDEN, clock 08:47. Sw 4-20 at Sw20 4-Holm E punt 29 yards to the SW49, 25-Brick C return 20 yards to the SW29 (8-Arnfridsson M;1-Benndorf E), PENALTY SW false start declined. Us 1-10 at Sw29 USA drive start at 08:32. Us 1-10 at Sw29 3-Jenkins O rush for no gain to the SW29 (77-Elmessaoudi Y). Us 2-10 at Sw29 84-Snyder A rush for no gain to the SW29 (70-Garchi N). Us 3-10 at Sw29 5-Mulligan K pass complete to 41-Klessa K for 14 yards to the SW15, 1ST DOWN US (21-Kjellin E). Us 1-10 at Sw15 5-Mulligan K pass complete to 25-Brick C for 15 yards to the SW0, 1ST DOWN US, TOUCHDOWN, clock 07:13. 5-Mulligan K rush attempt failed (fumbled). 12-Larsen A kickoff 69 yards to the SW1, out-of-bounds, SW ball on SW40. Sw 1-10 at Sw40 SWEDEN drive start at 07:13. Sw 1-10 at Sw40 PENALTY US offside 5 yards to the SW45. Sw 1-5 at Sw45 12-Gimhag M rush for 2 yards to the SW47 (82-May R). Sw 2-3 at Sw47 9-Alison M rush for loss of 6 yards to the SW41 (47-Martin K). Sw 3-9 at Sw41 PENALTY SW false start 5 yards to the SW36. Sw 3-14 at Sw36 12-Gimhag M rush for 6 yards to the SW42 (3-Jenkins O). Sw 4-8 at Sw42 4-Holm E punt 28 yards to the US30, 6-Gore R return 0 yards to the US30. Us 1-10 at Us30 USA drive start at 05:13. Us 1-10 at Us30 15-Grisafe S pass complete to 28-Hatcher B for 3 yards to the US33 (1-Benndorf E). Us 2-7 at Us33 15-Grisafe S pass incomplete to 1-Sowers E, dropped pass. Us 3-7 at Us33 15-Grisafe S pass incomplete to 9-Gray J. Us 4-7 at Us33 12-Larsen A punt 32 yards to the SW35, out-of-bounds. Sw 1-10 at Sw35 SWEDEN drive start at 04:14. Sw 1-10 at Sw35 12-Gimhag M rush for 13 yards to the SW48, 1ST DOWN SW (21-Brownson C). Sw 1-10 at Sw48 12-Gimhag M pass incomplete to 2-Beckman S (43-Golay D). Sw 2-10 at Sw48 12-Gimhag M rush for loss of 8 yards to the SW40 (82-May R). Sw 3-18 at Sw40 12-Gimhag M rush for 1 yard to the SW41 (45-Plummer J). Sw 4-17 at Sw41 4-Holm E punt 30 yards to the US29, downed. Us 1-10 at Us29 USA drive start at 02:18. Us 1-10 at Us29 15-Grisafe S pass incomplete to 83-Peterson H.
Us 2-10 at Us29 3-Jenkins O rush for 71 yards to the SW0, 1ST DOWN US, TOUCHDOWN, clock 01:58. 33-Wilkinson D rush attempt good. 12-Larsen A kickoff 45 yards to the SW25, 14-Persson A return 10 yards to the SW35 (45-Plummer J;22-Reyes A). Sw 1-10 at Sw35 SWEDEN drive start at 01:51. Sw 1-10 at Sw35 2-Beckman S rush for loss of 4 yards to the SW31 (44-Eddy V). Sw 2-14 at Sw31 34-Carrick S rush for 2 yards to the SW33 (30-Hinkle L). Sw 3-12 at Sw33 Timeout USA, clock 01:04. Sw 3-12 at Sw33 12-Gimhag M pass incomplete to 24, PENALTY US personal foul (45-Plummer J) 15 yards to the SW48, 1ST DOWN SW, NO PLAY. Sw 1-10 at Sw48 34-Carrick S rush for no gain to the SW48 (45-Plummer J). Sw 2-10 at Sw48 PENALTY US offside 5 yards to the US47. Sw 2-5 at Us47 End of half, clock 00:00. Sw 2-5 at Us47 Start of 3rd quarter, clock 12:00, 4-Holm E kickoff 6 yards to the US41, 85-Marks K return 10 yards to the SW49 (20-Aslund A). Us 1-10 at Sw49 USA drive start at 11:50. Us 1-10 at Sw49 84-Snyder A rush for 21 yards to the SW28, 1ST DOWN US (25-Svensson E;55-Erhardsson A). Us 1-10 at Sw28 15-Grisafe S pass complete to 24-Fitcheard-Bryso for 8 yards to the SW20 (32-Kiviharju E). Us 2-2 at Sw20 15-Grisafe S rush for 20 yards to the SW0, 1ST DOWN US, TOUCHDOWN, clock 10:50. 12-Larsen A kickoff 45 yards to the SW25, 14-Persson A return 5 yards to the SW30 (22-Reyes A). Sw 1-10 at Sw30 SWEDEN drive start at 10:45. Sw 1-10 at Sw30 12-Gimhag M rush for loss of 4 yards to the SW26, PENALTY US 12 men on the field 5 yards to the SW35, NO PLAY. Sw 1-5 at Sw35 12-Gimhag M pass incomplete to 14-Persson A.
Sw 2-5 at Sw35 12-Gimhag M rush for 6 yards to the SW41, 1ST DOWN SW (47-Martin K). Sw 1-10 at Sw41 PENALTY SW false start 5 yards to the SW36. Sw 1-15 at Sw36 12-Gimhag M pass complete to 2-Beckman S for no gain to the SW36 (17-Campolo A). Sw 2-15 at Sw36 2-Beckman S rush for 2 yards to the SW38 (82-May R;68-Blackmon K). Sw 3-13 at Sw38 12-Gimhag M pass complete to 4-Holm E for 15 yards to the US47, 1ST DOWN SW (13-Welter J). Sw 1-10 at Us47 2-Beckman S rush for no gain to the US47 (83-Peterson H). Sw 2-10 at Us47 12-Gimhag M rush for loss of 1 yard to the US48 (21-Brownson C). Sw 3-11 at Us48 12-Gimhag M pass incomplete to 9-Alison M, dropped pass. Sw 4-11 at Us48 4-Holm E punt BLOCKED, recovered by US 85-Marks K at SW25 (blocked by 16-Sowers K). Us 1-10 at Sw25 USA drive start at 06:59. Us 1-10 at Sw25 15-Grisafe S pass complete to 1-Sowers E for 3 yards to the SW22 (7-Jernberg A;32-Kiviharju E). Us 2-7 at Sw22 15-Grisafe S pass complete to 9-Gray J for 22 yards to the SW0, clock 06:13, PENALTY US illegal block 12 yards to the SW10, NO PLAY. Us 2-G at Sw10 25-Brick C rush for 10 yards to the SW0, TOUCHDOWN, clock 06:09. 12-Larsen A kickoff 45 yards to the SW25, 9-Alison M return 16 yards to the SW41 (45-Plummer J). Sw 1-10 at Sw41 SWEDEN drive start at 06:03. Sw 1-10 at Sw41 34-Carrick S rush for 6 yards to the SW47 (16-Sowers K). Sw 2-4 at Sw47 12-Gimhag M rush for 10 yards to the US43, 1ST DOWN SW (16-Sowers K). Sw 1-10 at Us43 12-Gimhag M rush for loss of 4 yards to the US47 (68-Blackmon K). Sw 2-14 at Us47 12-Gimhag M rush for 2 yards to the US45, fumble by 12-Gimhag M recovered by US 68-Blackmon K at US43. Us 1-10 at Us43 USA drive start at 04:29. Us 1-10 at Us43 3-Jenkins O rush for 32 yards to the SW25, 1ST DOWN US (21-Kjellin E). Us 1-10 at Sw25 5-Mulligan K pass complete to 1-Sowers E for 6 yards to the SW19 (32-Kiviharju E). Us 2-4 at Sw19 5-Mulligan K pass complete to 23-Vilarino N for 14 yards to the SW5, 1ST DOWN US (25-Svensson E). Us 1-G at Sw05 5-Mulligan K pass complete to 41-Klessa K for 4 yards to the SW1 (42-Nyman V). Us 2-G at Sw01 3-Jenkins O rush for loss of 1 yard to the SW2 (77-Elmessaoudi Y). Us 3-G at Sw02 5-Mulligan K pass complete to 28-Hatcher B for 2 yards to the SW0, TOUCHDOWN, clock 02:10. 12-Larsen A kick attempt failed, PENALTY SW offside 1 yards to the SW2, NO PLAY. 12-Larsen A kickoff 47 yards to the SW23, 14-Persson A return 15 yards to the SW38 (30-Hinkle L). Sw 1-10 at Sw38 SWEDEN drive start at 02:03. Sw 1-10 at Sw38 34-Carrick S rush for loss of 6 yards to the SW32 (82-May R;45-Plummer J). Sw 2-16 at Sw32 12-Gimhag M pass incomplete to 14-Persson A.
Sw 3-16 at Sw32 34-Carrick S rush for loss of 2 yards to the SW30, fumble by 34-Carrick S recovered by US 26-Converse C at SW26. Us 1-10 at Sw26 USA drive start at 01:05. Us 1-10 at Sw26 15-Grisafe S pass complete to 80-Berggren A for 26 yards to the SW0, 1ST DOWN US, TOUCHDOWN, clock 00:55. 12-Larsen A kick attempt good. 12-Larsen A kickoff 45 yards to the SW25, 9-Alison M return 5 yards to the SW30 (9-Gray J), PENALTY US face mask 20 yards to the 50 yardline, 1st and 10, SW ball on 50 yardline. Sw 1-10 at Sw50 SWEDEN drive start at 00:43, 34-Carrick S rush for loss of 1 yard to the SW49, fumble by 34-Carrick S recovered by US 16-Sowers K at SW49. Us 1-10 at Sw49 USA drive start at 00:43. Us 1-10 at Sw49 10-Smith A rush for loss of 1 yard to the 50 yardline (1-Benndorf E). Us 2-11 at Us50 3-Jenkins O rush for no gain to the 50 yardline (25-Svensson E;42-Nyman V). Us 3-11 at Us50 Start of 4th quarter, clock 12:00. Us 3-11 at Us50 28-Hatcher B rush for 8 yards to the SW42 (1-Benndorf E). Us 4-3 at Sw42 12-Larsen A punt 32 yards to the SW10, downed. Sw 1-10 at Sw10 SWEDEN drive start at 11:04. Sw 1-10 at Sw10 2-Beckman S rush for no gain to the SW10 (17-Campolo A). Sw 2-10 at Sw10 12-Gimhag M pass incomplete to 9-Alison M, dropped pass. Sw 3-10 at Sw10 12-Gimhag M pass incomplete to 9-Alison M.
Sw 4-10 at Sw10 4-Holm E punt 32 yards to the SW42, downed, PENALTY US roughing the kicker (17-Campolo A) 15 yards to the SW25, 1ST DOWN SW, NO PLAY. Sw 1-10 at Sw25 12-Gimhag M rush for 2 yards to the SW27 (17-Campolo A). Sw 2-8 at Sw27 PENALTY SW false start 5 yards to the SW22. Sw 2-13 at Sw22 12-Gimhag M pass incomplete to 14-Persson A.
Sw 3-13 at Sw22 12-Gimhag M pass intercepted by 30-Hinkle L at the SW27, 30-Hinkle L return 0 yards to the SW27. Us 1-10 at Sw27 USA drive start at 09:03. Us 1-10 at Sw27 84-Snyder A rush for 8 yards to the SW19 (34-Carrick S;1-Benndorf E). Us 2-2 at Sw19 25-Brick C rush for 9 yards to the SW10, 1ST DOWN US (1-Benndorf E). Us 1-G at Sw10 3-Jenkins O rush for loss of 4 yards to the SW14, fumble by 3-Jenkins O recovered by SW 42-Nyman V at SW14. Sw 1-10 at Sw14 SWEDEN drive start at 07:57. Sw 1-10 at Sw14 2-Beckman S rush for 1 yard to the SW15 (46-Elmore K). Sw 2-9 at Sw15 Timeout SWEDEN, clock 07:14. Sw 2-9 at Sw15 12-Gimhag M rush for 2 yards to the SW17 (30-Hinkle L). Sw 3-7 at Sw17 2-Beckman S rush for loss of 3 yards to the SW14, fumble by 2-Beckman S recovered by US 16-Sowers K at SW14, 16-Sowers K for 14 yards to the SW0, TOUCHDOWN, clock 06:42. 12-Larsen A kickoff 47 yards to the SW23, 9-Alison M return 15 yards to the SW38 (8-Vasquez S;13-Welter J). Sw 1-10 at Sw38 SWEDEN drive start at 05:52. Sw 1-10 at Sw38 2-Beckman S rush for loss of 2 yards to the SW36 (82-May R). Sw 2-12 at Sw36 12-Gimhag M pass incomplete to 9-Alison M.
Sw 3-12 at Sw36 12-Gimhag M pass intercepted by 21-Brownson C at the US43, 21-Brownson C return to the US43, PENALTY US pass interference 15 yards to the US49, 1ST DOWN SW, NO PLAY. Sw 1-15 at Sw46 2-Beckman S rush for 5 yards to the US49 (44-Eddy V). Sw 2-10 at Us49 2-Beckman S rush for loss of 1 yard to the 50 yardline (13-Welter J). Sw 3-11 at Sw50 12-Gimhag M sacked for loss of 9 yards to the SW41 (81-Deering J). Sw 4-20 at Sw41 Timeout SWEDEN, clock 02:33. Sw 4-20 at Sw41 4-Holm E punt 29 yards to the US30, 25-Brick C return 1 yards to the US31 (32-Kiviharju E). Us 1-10 at Us31 USA drive start at 02:20. Us 1-10 at Us31 28-Hatcher B rush for 8 yards to the US39 (22-Ek-Terlecki F). Us 2-2 at Us39 84-Snyder A rush for 6 yards to the US45, 1ST DOWN US (77-Elmessaoudi Y). Us 1-10 at Us45 28-Hatcher B rush for 11 yards to the SW44, 1ST DOWN US (7-Jernberg A). Us 1-10 at Sw44 TM-Team USA rush for loss of 1 yard to the SW45. Us 2-11 at Sw45 End of game, clock 00:00.